Father and Son. This is an image of Sir Lancelot and Sir Galahad.. Wallpaper and background images in the 刺猬索尼克 club tagged: sonic hedgehog silver shadow. This is an image of Sir Lancelot and Sir Galahad. it ain father and son cuz it basicly silver and shadow. uh.... Static_hedgehog... shadow loves maria. maria loves shadow. maria turned to a hedgehog. shadia. also; rouge cant stand shadow. i rest my case. AHHHH!Silvers father is Shadow! Silver is so HOTTTT! Blaze is so lucky to have Silver by her side! 1. The way it's portrayed here, as father and son. Also, on the subject of relations of Shadow and Silver, I have Silver as Shadow's great-great-great grandson. Distant, sure, but still related. maria nvr turned into a hedgehog. where did u get that?@shadowcharmer. but ur right with rouge. rouge doesnt have a crush on shadz. they cant b father and son. shadow is the prototype of himself (besides biolizard) and silver is born 100 uears into the future. btw, i like this pic! For those who are arguing or confused. In the arthurian legends galahad is lancelots son. 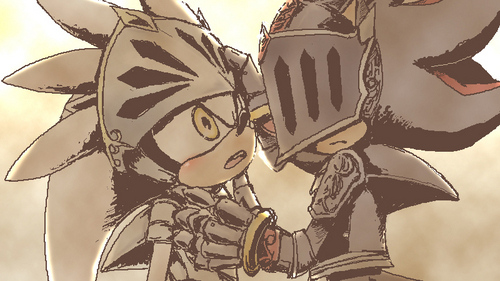 In sonic in the black night lancelot is shadow and silver is galahad, leading to a father and son type thing. Nobody knows who silvers parents are but ian flynn, the writer for the comics, said that silver IS a descendant of shadow and amy. Leading to the possiblity that silver is shadows grandson. Shadamy haters dont hate on me because im stating the truth and shadouge lovers also dont hate on me. Were free to believe that shadow can be with who he wants ( im a shadamy and a shadouge fan ). But its really up to sega. Ps: dont hate here but maria robotnik never turned into a hedgehog....... And i dont think shadow loved her like that, he saw her of more of a sister than girlfriend. -__ - rouge is not silvers mom for one shes a fridgen bat and two silvers a hedgehog wit physic powers. Rouge dosnt have any powers but wings. she wasnt even mentioned in the game.